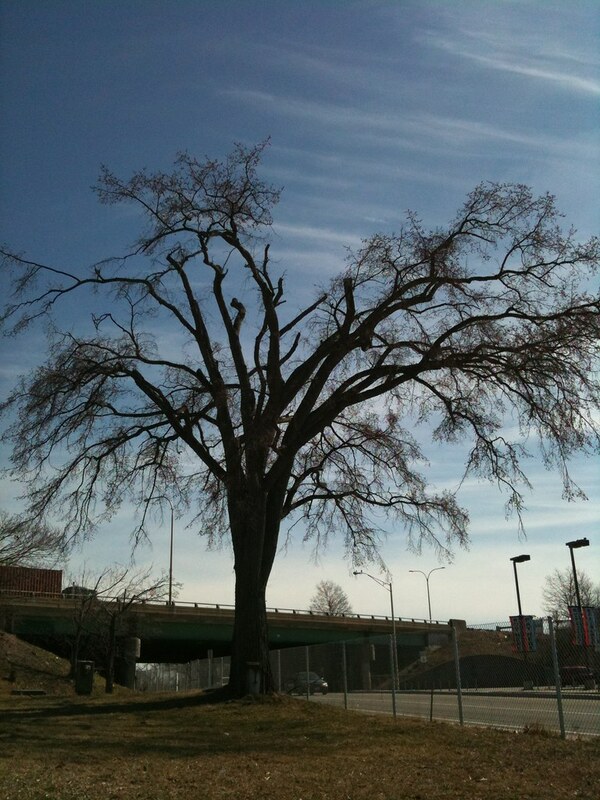 A reader wrote in to us several weeks ago to report the lobotomization of several trees on Elmwood Avenue at the ramp from Route 95. Among the trees that had their tops sheared off was Elmer, who survived both the widening of Elmwood Avenue, which resulted in the removal of most of its namesake trees, and the construction of Route 95. The photo below was submitted by our reader and shows Elmwood Avenue during the construction of Route 95 in 1966. Elmer is visible at right past the bridge abutments. 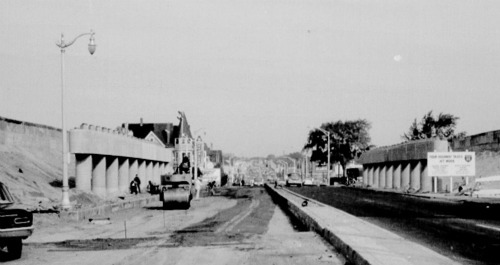 Elmwood Avenue in 1966 during the construction of Route 95. RIDOT did not perform this cutting. 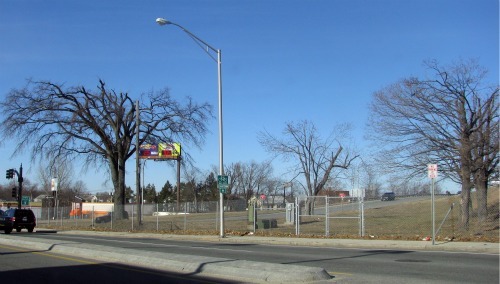 The Department issued a permit that allowed for tree trimming close to I-95 near a billboard. The cutting went beyond the area outlined in the permit. The Department is investigating the matter further. I have heard nothing more about the Department’s investigation. The trees, not only are nice to look at, but in part help mitigate pollution created by Route 95. As the city struggles to find the resources to increase its tree canopy, it is certainly disheartening to see RIDOT allowing this to happen to trees within the city under its care. Our reader suggests that those who have interest in expressing their concern about this issue should address their emails and calls to Susan Votta, supervising landscape architect at RIDOT. Everytime I say to myself “that’s got to be the stupidest thing I’ve ever heard” something else comes along to make me realize that statement will never be true. 1) Trimming trees so that people driving on a highway have a better view of a distraction. This sign is not in easy purview of northbound drivers, you have to shift your attention. The trees are not in the way of southbound drivers, for whom the billboard was ostensibly intended. 3) That the billboard’s use is by another state agency, not just a greedy private business type. And that the state agency maybe should have a little better overall vision. 4) That the state agency in question is the “let’s put an extra tax on people that are already bad at managing money and then let’s call it beneficial to society” agency. Maybe, they took the top off Elmer, ground it down, and made lottery tickets with it. It was probably Lamar, the billboard company, that did it. This won’t kill the tree. It’ll grow back. Sure, it will continue to live, but it will never grow back into its original shape. The damage is done. They don’t look like they were pruned with any care, like they were just cut to the level needed. I would worry about rot setting in at exposed ends. Yeah, the tree will probably survive, but it will always be a weird, decapitated shape. It is pretty irreparably damaged. There are ways to prune trees so they stay healthy and retain a natural shape. This is the opposite of that. No one seems to have seen the decapitation happen, even city Parks/Forestry, whose offices are right there in Roger Williams Park. I can’t believe a billboard company is given that much leeway with what they can do. Honestly, I’d like to see VT-style billboard laws… none… as in no billboards. I hate the damn things. You’d think a city dying for some revenue would actually start enforcing some of the codes and fines it can levy. Here is the Street view of 95 going north. The billboard in question is kind of in the middle of this view. Just to the left are the elms. You can see that they don’t do anything to obstruct the view. They may have grown a bit since this view (Fall of 08 I think) but they would have to grow 20 feet to actually obscure that thing. The “pruning” has taken the trees to below the level of the street lights you can see in front of them. Obviously Lamar probably ordered the work, but it really seems like something where some official from the lottery would have to call and complain. Even shoddy tree work isn’t free, and Lamar has no incentive to clear that view unless it is brought to their attention. This isn’t the only place where destruction of trees has taken place around billboards. It’s just the most dramatic case because the tree happened to be special. All of the trees around the billboards along Route 10 have been hacked. In some cases they’ve been completely cut in half. I’ve noticed similar destruction in other places on Route 95. I’m documenting all of it. Lamar should most definitely be held responsible. A large “donation” to the Sharpe Tree Fund would be a good place to start. @runawayjim That would be ideal. Really, the law should state that the trees, especially surrounding highways and major roads, have the right to be there and to grow ungroomed (unless they grow into the street or power lines or something). If they block the view of a billboard, the billboard should have been located elsewhere. Trees should not be permitted to come down for a billboard. Also, trees over a certain age should not be permitted to be hacked like that at all, unless verified by the city forester as being diseased or rotted out. Billboards, for me, are the lowest use of space, even below surface parking. I don’t even think billboards should be allowed on top of a building (especially in the case of the one on top of the Dunkin Donuts building on the corner of Smith and Academy), but it’s a better location than just a free standing monstrous advertisement. I don’t see why RIDOT should be at all involved with the problems of a private advertiser on private land. If RIDOT put up the billboard on their own land, and no one could see it, and RIDOT was getting direct revenue from the sign, OK, I can see that. But someone saying, “no one can see my sign because of your trees…” Too bad. I would like to make that little exchange my new ringtone. This is so disheartening for so many folks who have been working WITH RIDOT to plan improvements for Elmwood Avenue. I want to remain optimistic but it seems RIDOT simply doesn’t know what it means to be a neighborhood citizen. Although it was probably Lamar, it is still RIDOT’s purview and their responsibility to administer and supervise work in their right-of-way. I just drove by this, they literally cut the top half of the tree off, it looks really bad, not at all done with any care towards the tree. My admittedly limited understanding of tree care is that those large branches that are just lopped off at right angles, need to be trimmed back to their crotches (which I think is the technical term for where a branch meets another branch or the trunk). If left as is, the exposed ends will absorb water, which will rot them, then the rot could potentially spread, sickening and eventually kill the entire tree. Someone who knows more about trees please feel free to confirm or deny that. that isn’t really what the problem will be. Trees limbs are kind of like organs. You can live without part of your liver, without one of your kidneys etc, but if too much is taken away, the tree can’t possibly continue to live. The too many cuts issues becomes problematic because not that it will get wet and rot but because it leaves openings for things like bugs and disease to get in, because the tree is also in a weakened state. So while these elms will bush out a bit on the top, their end is near. They have already been through so much by just being urban trees, the assault is probably the final nail in their elm coffins. So to speak. Of course I didn;t see these trees lately so it is possible some of the branches taken out were deadwood, but they still did a crappy job of pruning, even if they were sanitizing the tree (taking out the dead stuff). It appears that “Elmer” is dead. it is unfortunate that this was the thing I was finally right about. But speaking of Elm…What ever happened to the Liberty Elm Diner? Aside from the fact that they are closed now, indefinitely?